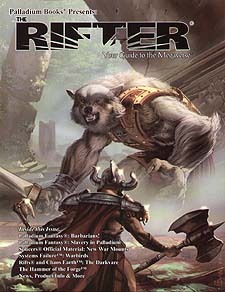 The Rifter is your doorway to unlimited imagination and numerous Palladium role-playing worlds. It offers new heroes, powers, weapons, magic and adventure for your games. It presents new villains, monsters and dangers to battle and new ideas to consider. It helps you unlock your imagination by showing you what gamers, just like you, have created. That's right, many of the articles and source material are written by ordinary gamers and fans like you. Are you ready to send us creations from your imagination? * Rifts & Chaos Earth: Darkvare, a monster form the the Astral Plane. * Splicers: War Mounts for House Shiva. * Systems Failure: Aircraft and source material. * Palladium Fantasy RPG: Slavery, barbarians and adventure. * The latest chapter of Hammer of the Forge. * News, coming attractions and fun. * 96 pages of imagination unleashed.